It was simply the most beautiful evening I have ever spent - a full moon, a blue bazillion lumens of lights and sparkles and just absolute beauty! My Neville's Haze was grown organically outdoors in South Florida USA. It was harvested December 5th, 6th, and 7th and has been drying and curing ever since. I broke it open last night. The weed smells like pepper. While it was drying the house smelt very strongly of pepper - not a hot irritating smell but more like a fragrant pepper flower. 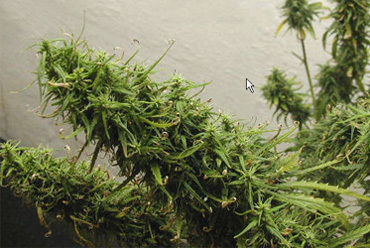 Buds are very sticky - you could wad up a handful and they would stay molded in the shape of your hand. Anyway - about 3 hits each, and we're babbling. Chatter, chatter - typical of the three of us together, music DVD playing - just another evening at home with the Hound family. Then I noticed I could not understand what my friend was saying - she was talking but no sound was reaching my ears. I had to ask her "what?" a couple of times before I realized that I could not understand spoken English. The only way I could understand her speech was to concentrate very closely on reading her lips. I could hear and understand the words in the music with no problem, but not real human speech. That was a first for me... I could not coordinate all the physical processes at one time. I had to remember to first manually turn my head in her direction, then consciously move my eyes to her lips, and then try to catch each word as it came out. They came out so fast I could not "see" each one individually - it was like alphabet soup. She was trying to ask me if the weed was laced (no - just excellent), but had as much trouble speaking the words as I did following them. I also felt a bit of a blood pressure spike, and some eye stress type visualization effects towards the edges of my peripheral vision. We had a great giggle fest - side splitting laughter like you remember from the old days, for no particular reason. We were capable of doing things - aside from the difficulty with my head motor skills seemed relatively unaffected. We fired up the grill and turned out some mighty tasty salmon without burning the house down, and the kitchen is still standing this morning. I do remember that each of us felt compelled to check the grill about 10 times to make sure we turned the propane off... safety first! It was simply the most beautiful evening I have ever spent - a full moon, a blue bazillion lumens of lights and sparkles and just absolute beauty! Cold crisp air like we rarely get down here - stars.. good lord it was awesome!! My husband, my best friend, and my dogs.... a righteous good time. Eventually my friend has to go home - the husband and I head home for some calming indica, some chocolate, a comforter and a good snuggle sitting around the chimnea on the patio. An excellent evening all the way around. I didn't have extreme munchies at all (but I rarely do), no body stone to speak of, I slept really well, and no weed hangover this morning. Not your typical everyday "relaxation weed" but great for socializing with some carefully selected friends. Yes - I recommend it! Thank You Shanti for this great accomplishment - easily the best smoke I have ever had!! 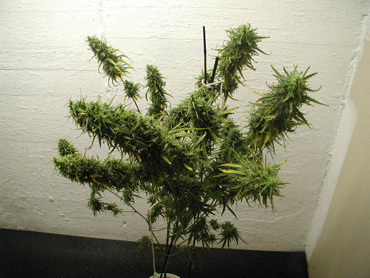 Feel free to contribute by sending us pictures of your plants or grow reports.